Due to the extremely strong "Super-Grip" of our clamping pliers, even tight-fitting nuts, which are often already heavily worn, can still be gripped. Our grip pliers are characterised by their really good quality, the jaws have variable clamping widths and are easy to open by quick release levers. 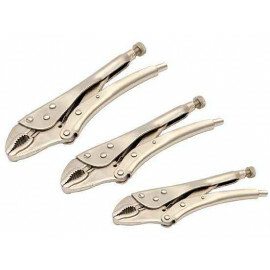 220 mm pliers: 44 mm.